Dennis Merritt Jones wrote in The Art of Abundance, “The secret to life is that you are one with the Universe, the original and only source of all abundance.” Our goal at The Life Enrichment Center is to no longer keep our oneness with the Source of all abundance a secret in our life. Despite appearances we live in a Universe that offers an extremely plentiful or over-sufficient quantity of supply for all that live within It. At this very moment we are one with an overflowing fullness that continues to fill the Universe in which we live with more than enough for everyone; with a fullness of life that, if we’d allow It, would overflow into every area of our life. We begin to allow the fullness of Life to enter our experience by choosing to consistently live in conscious communion and connection with our Unlimited Source—not just some days and not just Sundays, but to consciously “Be One with Life” everyday. How do we do that? By letting go of our tug-of-war with the world, our day-to-day struggle to get our fair share of its visibly limited resources before they run out or someone else gets ours. By living (instead) in receiving mode, in the mental-emotional ease of allowing the Invisible Unlimited Source of Life that gives to all alike, to give to us. The prosperous life we’re talking about isn’t about palaces, fur coats and limousines (unless that’s your thing). We’re talking about a life of joyous freedom that has been described as “the ability to do what we want to do, when we want do it.” We are created to be whatever we desire to be, to do whatever we choose to do, and to live fully everyday. Why would we pinch our self off from a Universal Abundance that gives us so much freedom? It is almost as if the world calls to us to prove its lack and limitation. And, we answer that call by allowing it to withhold more and more from us until it appears there’s not enough good to go around. A good question to consider might be: “What am I trying to prove with my life? Am I trying to prove that I’m sourced with all I need to live the life that (to me) seems worth living, or to prove that somehow I’ve been left out of the blessings of the Universe, and I have good reason to sit on my pity pot on the sidelines of own life. We “prove the world” by focusing on its effects as our only source and the only reality. We prove it by appearing to be separate from our good, not because we actually are, but because we’re ignorant of the Cause of all effects–the invisible unlimited vibrational energy of the Universe. If we’re constantly thinking about, and talking about, and acting as if we are separate from the Powerful Laws of the Universe that govern It, we live in opposition to the very Source that would help us, heal us, and reveal to us the Power that lives in us. To consciously Be One with Life is to affirm our Oneness with our Source with our every thought, word and action; with our full focus, attention and imagination. Do you believe you are the creator of your own reality? Do you believe that what you see belongs to you because you experience the effects of your thoughts? If the answer is “yes,” then you’ll feel no resistance to focusing on what you want even before it arrives in physical form and expression. In fact, you’d be foolish not to focus on what’s wanted. When we trust that our thoughts are calling our good to us, we feel happy and satisfied even before that good appears as health in our body, love in our relationships, or money in our bank account. Through the Law of Attraction, we attract to us what we want or we don’t want depending on what are mind is focused on. Every subject is really two subjects—a pair of opposites, different ends of the same stick. One thing defines the other as present or absent—health and sickness, joy and sorrow, wanted and unwanted. In this world we can’t have one without the other. There is only one stick and we’re one with It! The intensity with which we don’t want something is the same intensity with which we do want something. What comes to us depends on what we’re looking for. If we’re thinking about and talking about what we don’t want, that end of the stick lights up because we energize it with our attention. 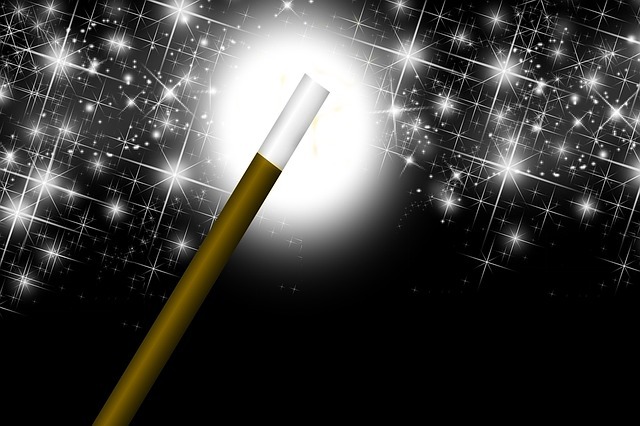 It becomes the point of attraction, like a magic wand we wave around and use to create our life. Our belief system is made up of thoughts we keep thinking and thinking and thinking about until they become full-blown, energized beliefs about things we don’t want. And, then we’re surprised when those things come to us! If our good seems to elude us no matter how much we want it–If the healing we want, the relationship we want, the financial freedom we want, the satisfaction in living we want still seems to be missing—It’s likely we’re looking for our good in all the wrong places and not in direction it’s coming from. We’ll imagine the worst and feel helpless when the best is right where we are if we’d only look at that end of the stick. To be aware at all times that we are One with Life is to be conscious that we are One with the Creative Power that is creating our life experiences. When we leave our Invisible Source out of our perception of life, that omission affects our health, happiness, financial freedom, enthusiasm, joy, satisfaction, and our experience of Being the Powerful One we’re created to be. When we mentally leave the Source of our Life out of our life, we’ve left the biggest part of our Self out of our life-Our Inner Being already knows our Oneness with Life. It’s already overflowing with good to prove it, if we’d let It. Our Inner Being has absolutely no resistance to our health, happiness, financial freedom, or anything else we may want. It never believes we can’t do something or have something, and Its always focused on the end of stick where it’s at. That’s why when we’re not focused there, we feel so miserable and powerless. We’re not Being one with the One we are. No matter how long we’ve been focused on the end of the stick where our good is absent, we can choose to focus along with our Inner Being on where it is Present. We’ve been given both ends of the stick in this “this and that” world because the contrast between pairs of opposites helps us discover what we want, what we don’t want, and our power to choose between them. It is through our individual choices that we create the life we want to live. In this way, through our unique creations in life, we expand creation within the Universe. Nothing is withheld from us in meeting that purpose. The entire Universe wants us have everything we want (and then some). But it is up to us to prove it!